The movie somehow manages to reach you on an emotional level, but as a whole it has a lot of flaws. Perhaps by wanting to be socially relevant, Mother Lily drags in the issue of human trafficking and loosely connects it to the heroine's mother, to whom the subhead actually refers, and whose role could easily be summarized as a footnote or a passing thought and no one would even bother to care. This movie is really all about Melinda, and her kids. End of story. The other story elements seem contrived and disposable. The lousy editing does not help. I've seen Chinese women roles portrayed with more gusto and believable coldness by other actresses (remember Dao Ming Sz's mother in Meteor Garden?) but Zsa Zsa here is an effing caricature. The accent is just disturbing. Her role as a villain is ineffective. When Melinda plants a fist on Olive's face, you do not feel triumph. You feel like you are watching a comedy bar skit. The villain is supposed to be hated but understood. Here, she is laughed at. 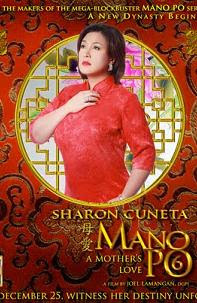 Aside from Angelica Panganiban (and perhaps, Iza Calzado), Sharon really has no other competition for Best Actress. I think she will get it. This is a personal bias. I like Angelica and I think she could act, but I think Sharon affected me more with her acting. Or maybe it is not the acting, but rather the role. But an upset is always cool, so Angelica FTW! Hahaha. One good thing is that they seem to have gotten more actors with Chinese blood this time, at least in the supporting roles. It does lend something, although not really enough, to the authenticity of it being a film about the Chinese. I would have loved to see how Angel Locsin would tackle a bitchy role, but IMO Heart Evangelista has been a good replacement. And she looks Chinese too, because she actually is. Dennis Trillo also looks Chinese, because he also is. Decent acting from this two. The role I love best is that of Ciara Sotto's, rebelling because she is the one always around but feeling the least needed. The problem is Ciara Sotto cannot act to save her life. She often disappears in the scene because she cannot even hold her own against the other actors around her. She, along with the PBB girls, are obviously the weakest link in this otherwise well-acted movie. But the PBB girls got bit parts, and Ciara is around for more than half of the movie. I think the problem with this movie is the direction. That Joel Lamangan person is just overrated. And he seems to love stereotypes, whether it be Chinese or gay characters. At the end you will be satisfied with this film because it is feel-good, so very Christmas. It also helps a lot that you have (or have had) a mother. That fact would help you a great deal to sympathize with the characters. That is why I gave it a four. If it is not Christmas I would have given it a three. If I were asexually reproduced I would have given it a two.